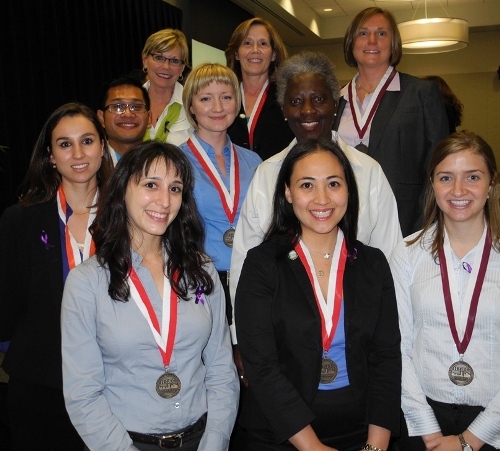 The “Forget-Me-Nots,” a 10-member team of students from The University of Texas Health Science Center at Houston (UTHealth), the University of Houston and Texas Woman’s University, won first place at the 2013 Geriatric Interprofessional Student Competition Monday night. Their mentor was UT School of Dentistry Professor Donna Warren-Morris, RDH, MEd, of the Department of Periodontics and Dental Hygiene. The annual event is sponsored by the Houston Geriatric Education Center at UTHealth, with support from UTHealth Vice President Charles Figari of Auxiliary Enterprises. The winning team included UTHealth students Gwendolyn Brobbey, MD, MPH, (biomedical informatics), Deep Pujara (public health) and Erika Wood, MPH, (medicine); as well as TWU students Gregory Brusola (physical therapy), Leslie Melton and Julia Rhodes (occupational therapy); and UH students Antonia Caliboso, Sarah Grudier and Kathleen Lanini (social work) and Solange Inzillo, (communication science and disorders). This year, 55 students competing in five teams took on the challenge of performing a needs assessment in assigned communities in Houston to evaluate potential success of establishing a “Memory Café” in those areas. The Forget-Me-Nots evaluated Houston’s Third Ward and identified Wheeler Avenue Baptist Church as a potential site for a Memory Café. A Memory Café is a variation on a traditional support group, offering people with early to moderate dementia, Alzheimer’s or other memory problems a place to gather — along with their caregivers — to meet others in similar situations. The concept was pioneered by a psychiatrist, Dr. Bere Meisen, in The Netherlands in 1997. The judges included H-GEC Director Carmel Dyer, MD; June Sadowsky, DDS, MPH, of UTHealth School of Dentistry; Lynn Maher, PhD, of UH; and Carolyn Kelley, PT, DSc, of TWU. Additional judges came from H-GEC’s community partners: Ann Marie McDonald, Mallory Freitag and Daniel Heathcock of the Alzheimer’s Association; Susie Howard of Amazing Place; Katie Scott, MPH, of Sheltering Arms; and Kelly Lou, MSW, and Denise Truong, MPH, of the Chinese Community Center. H-GEC faculty who served as mentors to the teams included Warren-Morris of the School of Dentistry;Vaunette Fay, PhD, RN, of UTHealth School of Nursing, Dr. David Flores of UTHealth Medical School; Nancy Ordonez, PharmD, of UH, and Dr. Gayle Hersch, PhD, OTR, of TWU. Two students from the School of Biomedical Informatics served on teams in the competition, including above mentioned Gwendolyn Brobbey and Anna Xu, PhD student. The Houston Geriatric Education Center (H-GEC) is one of 45 Geriatric Education Centers in the United States funded through a Health Resources and Services Administration of the U.S. Department of Health and Human Services Grant. The overarching goal of the H-GEC is to reduce health disparities, address causes of vulnerability, and meet the social and healthcare needs of older Americans, which requires responsible, consumer-friendly, interprofessional teams of health professionals who are experts with experience in elder care. Not only are knowledge and skill needed, but also a holistic mindset that is sensitive to the special challenges and changes that occur as a person ages. Health care professionals are required to support public policies that are based on sound ethical principles and beneficial to vulnerable elders. The 2013 Geriatric Interprofessional Student Team Competition was comprised of five teams encompassing 55 students from biomedical informatics, communication sciences and disorders, dental hygiene, dentistry, health and human performance, medicine, nursing, occupational therapy, pharmacy, physical therapy, public health and social work, representing The University of Texas Health Science Center at Houston, Texas Woman’s University and the University of Houston. All teams visited assigned community centers in the Houston area, conducted windshield surveys of the communities and submitted written projects detailing these assessments. The competition is a culmination of this acquired knowledge, with each team completing a presentation of their assessments and recommendations for services provided throughout the individual senior centers. The interprofessional faculty members scored the teams on their critical thinking skills, innovation, knowledge, creativity and the quality of the presentation.